Staff Recommends @CMPL: Phil recommends "A $500 House in Detroit"
Phil recommends "A $500 House in Detroit"
"A $500 House in Detroit: Rebuilding an Abandoned Home and an American City​" by Drew Philp is a fascinating true story of a young college grad who, with no job and very little money, purchases an abandoned Queen Anne home in Detroit with the intent of restoring it. This is no small task given that the home lacks windows, doors, heat, water, electricity, and a working roof. 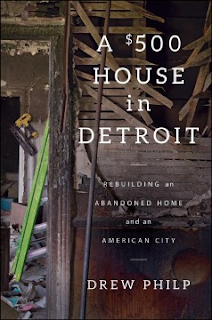 The comeback of Detroit has been much publicized but Philp's modest contribution to the cause is an interesting part of the larger story. His steadfast determination in the face of rampant poverty, crime, racial tensions - and monumental home improvement challenges - is inspiring. Ann recommends "The Girl Who Drank the Moon"
Kara recommends "Every Note Played"
Celia recommends "My Year of Rest and Relaxation"